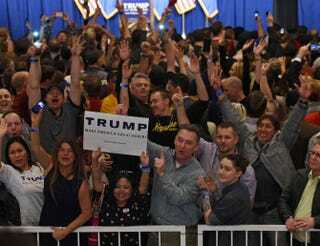 Supporters cheer while waiting for Republican presidential candidate Donald Trump to speak at a caucus-night watch party at the Treasure Island Hotel & Casino in Las Vegas on Feb. 23, 2016. “In an election season dominated by racist and xenophobic language on the right, Donald Trump distinguishes himself even among his more outspoken Republican challengers,” Inae Oh reported Wednesday for Mother Jones. “And according to a New York Times analysis of voters, so do his supporters, a majority of whom carry deeply intolerant attitudes toward gay people, Muslims, immigrants, and African Americans. “In fact, the report found 20 percent of Trump’s base disagree with the freeing of slaves after the Civil War, and a staggering 70 percent would still like to see the Confederate flag flying above official grounds in their states. “One-third of Trump’s primary supporters in South Carolina favored ‘barring gays and lesbians from entering the country.’ According to the Times, this is more than twice the support this proposal received by Ted Cruz and Marco Rubio backers. The New York Times issued two caveats in its report on intolerance among Trump supporters. “New data from YouGov and Public Policy Polling show the extent to which he has tapped into a set of deeply rooted racial attitudes,” Lynn Vavreck wrote Tuesday. “More than three decades before he became a familiar face on Sunday morning shows, cable television news and the late-night comedy circuit, Bernie Sanders made no secret of his contempt for commercial TV,” Jason Horowitz reported Tuesday for the New York Times. “He may have softened his language, but Mr. Sanders’s critique of the news media, as in nearly everything else, has remained constant as he has risen over the last 40 years from radical protester and protest candidate to mayor, congressman, senator and now a candidate for the Democratic nomination for president. Despite the advent of the Internet, the diminishing of traditional news media companies and the emergence of new media Goliaths like Facebook that have helped fuel his rise, Mr. Sanders remains orthodox in his mass media doctrine. Meanwhile, Christina Pazzanese of the Harvard Gazette at Harvard University quoted analysts of 2016 campaign coverage. David A. Graham, the Atlantic: Does Ben Carson Suspect His Campaign Was a Scam? Leonard Pitts Jr., Miami Herald: Is Donald Trump a man of faith? Kenny Irby, a longtime Poynter Institute faculty member who was forced out last year amid financial challenges, has been hired as community intervention director for the city of St. Petersburg, Fla., a newly created post, Charlie Frago reported Tuesday for the Tampa Bay Times. “Irby, 54, worked for Poynter as a visual journalism and diversity senior faculty member between 1995 and 2015. He is also a pastor at Bethel AMEC who has spent eight years as the state director of men’s ministry and youth outreach for the church, setting up chaplain programs, peer-to-peer mentoring and other programs across the state. “Most recently, he formed ‘Men in the Making,’ a program which pairs 30 kids with 17 role-models and meets regularly at St. Petersburg College’s Midtown campus. While at Poynter, Irby founded and led The Write Field program, which uses writing to connect with middle-school African American youths in St. Petersburg, Fla., the Poynter Institute’s hometown. Poynter owns the Tampa Bay Times. Irby had been a fixture at Poynter since 1995. His departure prompted a backlash in which some black community members objected so much to Poynter’s change in the program that by Irby’s count, all but two of the mentors refused to work without him. Christopher Warren was chosen as the mentorship program’s new director, hired as a contract worker. Frago’s report continued, “Roy Peter Clark, vice president and senior scholar at Poynter, said Irby is a perfect fit for a difficult task. "ABC announced Tuesday that 'The View' will be renewed for a 20th season, and along with that Candi Carter was named the show's first African American female executive producer," WTVD in Raleigh-Durham, N.C., reported Wednesday. In Philadelphia, "Renee Chenault-Fattah, the longtime NBC10 news anchor, has parted ways with the station, six months after she was placed on leave following the federal indictment of her husband, U.S. Rep. Chaka Fattah," Chris Brennan reported Wednesday for philly.com. Cheryl Devall, formerly an editor at NPR's "Code Switch" and at the Daily World in Opelousas, La., has joined the Center for Investigative Reporting as senior radio editor, based in the East Bay in Northern California, Robert J. Rosenthal, executive director of the center, confirmed on Wednesday. "Channing Dungey, executive VP of drama at ABC, has been named entertainment president of ABC, replacing Paul Lee, who was ousted in a power struggle with Ben Sherwood, president of Disney/ABC Television," Debra Birnbaum reported Feb. 17 for Variety. "She’s the first African-American to head programming at a major broadcast network. Dungey will now report directly to Sherwood. . . ."
"It's about to be a family affair at 30 Rock for NBC News anchor Lester Holt and his son, Stefan Holt, who soon will be anchoring a weekday newscast on the network's New York station, it was announced Tuesday," the Associated Press reported on Feb. 16. "Holt, 29, will start at WNBC in April, co-anchoring a newly launched afternoon newscast aired from 30 Rockefeller Plaza, the storied NBC headquarters from where 'NBC Nightly News with Lester Holt' originates. . . ."
"Sunny Hostin, who has been a host and legal analyst at CNN and HLN for six years, has joined ABC News as senior legal correspondent and analyst. ABC News president James Goldston made the announcement this morning," Mark Joyella reported Wednesday for TVNewser. Greg Howard, a reporter for Deadspin, is one of three journalists chosen to spend two years in the New York Times newsroom as part of a fellowship named for Times media columnist David Carr, Ravi Somaiya reported Tuesday for the New York Times. Howard caused a stir last year with a report on what he called Jason Whitlock's "nightmarish, comical reign" as leader of the Undefeated, ESPN's nascent site examining the intersection of sports, race and culture. Whitlock was removed, and Howard broke the news that ESPN was talking with Kevin Merida, then managing editor of the Washington Post, about the job. Merida is now the site's editor. "Keith Laing of The Hill is headed to The Detroit News, but he won't have to move — Laing joins their D.C. bureau as Washington correspondent covering auto lobbying and regulation starting next week," Kirsten Browning reported Wednesday for muckrack.com. "Mark Luckie, one of the tech world's most vocal advocates for diversity has joined the Reddit community," Mashaun D. Simon reported Feb. 16 for NBCBLK. "The former manager of News and Journalism at Twitter, Luckie will serve as the Head of Journalism and Media for the online community known to many as the 'front page of the internet.' . . ." Kristin Hare of the Poynter Institute added on Feb. 16, "After Luckie announced his new job, I asked him for his advice to other people who want to push for diversity in their workplaces. Here's what he said . . ."
"It’s Graciela Mochkofsky’s first week on the job and she already has a full to-do list," Teresa Mioli reported Saturday for the Journalism in the Americas blog at the Knight Center for Journalism at the University of Texas at Austin. "The Argentinian journalist has been named director of the new Spanish-language journalism initiative at the Graduate School of Journalism at the City University of New York (CUNY). . . ."
Jesus Ortiz, columnist at the Houston Chronicle, has joined the St. Louis Post-Dispatch as a columnist, Roger Hensley, assistant managing editor - sports, confirmed to Journal-isms on Wednesday. Ortiz starts April 4. "After a brief hiatus, columnist Albor Ruiz once again has a platform . . . to voice his opinions," Veronica Villafañe reported Sunday for her Media Moves site. "His column will now appear in English and Spanish in Philadelphia’s Al Día two times a week. .. ."
"Shiba Russell is gone from WNBC," NBC's flagship television station in New York, tunedinnyc.com reported on Feb. 12. "The anchor’s days were numbered at Channel 4 since Sibila Vargas came on board from Los Angeles in October 2013, supplanting Russell as night time co-anchor with Chuck Scarborough. . . ." Russell joined WNBC in 2011 as heir apparent to longtime anchor Sue Simmons, who left the station in 2012. "Longtime NBC News correspondent John Yang has joined PBS NewsHour as a general assignment correspondent," Mark Joyella reported Wednesday for TVNewser. "He begins at NewsHour on Monday. . . ."
The award for foreign reporting is to be shared by a team of four reporters from the Associated Press, "Margie Mason, Robin McDowell, Martha Mendoza and Esther Htusan, for a series on the Thai fishing industry, 'Seafood from Slaves,' and Ian Urbina of The New York Times for 'The Outlaw Ocean,' a six-part series that portrayed a largely unchecked pattern of lawlessness on the high seas. "The AP reporters documented the plight of impoverished men from Myanmar, Cambodia, Laos, and Thailand lured into captivity, locked in cages, beaten, and forced to perform dangerous work with little sleep to catch and process seafood destined for U.S. consumers and their pets. They found the graves of some workers who did not survive, buried on a remote island under false names. As a result of the AP reporting, more than 2,000 captives were released, ships were seized, and businesses closed, American companies faced calls to cease selling slave-tainted seafood, and authorities in Washington, at the United Nations, and across Asia began seeking new ways to confront and control the abuses. . . ."
"The award for National Reporting will go to The Washington Post for an exhaustive study of killings by police officers. The project found that 990 people were shot and killed by on-duty police officers in the U.S. in 2015 and also produced a trove of original data. After discovering that FBI statistics on deaths at police hands were unreliable and incomplete, the Post assigned staffers from across the newsroom to compile and analyze their own list. Post reporters found that most of those who died were armed white men shot under threatening and sometimes heroic circumstances, but also uncovered some troubling indicators. . . ."
Jamie Kalven of Invisible Institute "will be honored with the award for Local Reporting for 'Sixteen Shots,' published online by Slate Magazine last February. Operating on a tip about the October 2014 police shooting death of 17-year-old Laquan McDonald, Kalven located a witness who said McDonald was not lunging at them with a knife as Chicago police reported but 'shying away' and that an officer repeatedly fired into his immobilized body. . . ."
"Terrence McCoy of The Washington Post will be recognized with the award for Regional Reporting for his series of reports from Maryland and Virginia on companies operating in the shadows of the financial industry that buy the rights to court-ordered compensation from unsophisticated victims for a fraction of their value. McCoy stumbled on the practice, after learning that Freddie Gray, whose death in police custody sparked riots in Baltimore, sold his lead poisoning settlement for dimes on the dollar. . . ."
"The award for Education Reporting will recognize Cara Fitzpatrick, Lisa Gartner, and Michael LaForgia of the Tampa Bay Times for 'Failure Factories,' a deeply researched series that traced the decline of black student achievement in Pinellas County to a 2007 school board rezoning decision that effectively re-segregated five schools. . . ."
"The award for Radio Reporting will go to Nikole Hannah-Jones for 'The Problem We All Live With' broadcast on This American Life. Hannah-Jones, who is now on the staff of The New York Times, had just spent 18 months studying the re-segregation of American education for ProPublica. Struck that the first reaction of Michael Brown’s mother on learning of his death in Ferguson was how hard it been to get him to graduate from high school, Hannah-Jones decided to investigate Brown’s school district. . . ."
"Cartel Land is being presented with the award for Documentary Film. The Oscar-nominated documentary, directed and filmed by Matthew Heineman and produced by Heineman and Tom Yellin, sheds light on the Mexican drug war, specifically two vigilante groups, one on either side of the border, that take on the Mexican drug cartels. . . ."
"An IndyStar analysis of homicide data provided by the Indianapolis Metropolitan Police Department shows that since 2011 a significant gap has developed between the solve rates for black and white homicide victims — and 2015 was one of the worst years in the past decade," Jill Disis reported Friday for the Indianapolis Star. "In 2015, 87 percent of homicides involving white victims were considered solved by IMPD. But when the victim was black, the rate dropped to 50 percent. What's worse, it’s not projected to get much better. . . ." The story is part of a series, "Chasing Closure." "Men far outnumber women as directors, writers and industry executives," Mike McPhate reported Monday for the New York Times. "Minorities are drastically underrepresented in acting roles. Lesbian, gay and transgender characters are almost nonexistent. This is the portrait of an 'epidemic of invisibility' in Hollywood described by researchers in a study released on Monday of more than 400 movies and scripted television series from 2014 and 2015. 'The film industry still functions as a straight, white, boy’s club,' said the study, which was conducted by the Media, Diversity and Social Change Initiative at the University of Southern California’s Annenberg School for Communication and Journalism. . . ."
"On February 19, 1942, President Franklin D. Roosevelt signed Executive Order 9066 which led to the incarceration of 120,000 innocent Japanese Americans (video)" Al Jazeera wrote in text accompanying a video posted Feb. 18. "We spoke with people who lived through it." Supportive tweets from Eric Deggans, Amy Alexander, Michael Calderone and Sherri Williams were included in Corinne Grinapol's Feb. 19 posting on FishbowlDC, "Journal-isms Is Looking for a New Home After Maynard Institute Cuts Ties." "Giants defensive end Jason Pierre-Paul filed a lawsuit Wednesday against ESPN and reporter Adam Schefter for posting his medical records last summer," the Associated Press reported on Thursday. The lawsuit, filed in Miami Dade County in Florida, alleges that Pierre-Paul's privacy was violated — as was the state's medical records statute — by the report after the player severely injured his right hand in a fireworks accident on July 4. The New York Post first reported the lawsuit Wednesday night.. . ."
Robert Garcia of NPR will receive the First Amendment Service Award on March 16 from the Radio Television Digital News Foundation, the foundation announced on Feb. 15. "Robert has been practicing journalism for 38 years, 25 of them in executive management. He has been Executive Producer of the Washington Bureau of CBS Radio, Vice President and General Manager of the CNN Radio network, Washington Bureau Chief and then Director of News Coverage for ABC News Radio, and currently serves as the Executive Producer of the Newscast division of National Public Radio. With 24 million weekly listeners, NPR newscasts are the most widely heard content in public radio. . . ."
"ABC's Black-ish takes on a tough job Wednesday night (9:30 p.m., 6ABC) as Dre (Anthony Anderson) and Bow (Tracee Ellis Ross) finally talk to their kids about the police, as the family gathers in front of the TV to wait for the results of another investigation into the death of an African-American at the hands of cops," Ellen Gray wrote Wednesday for the Philadelphia Daily News. Larry Wilmore, 55, host of "The Nightly Show" on Comedy Central, "is down an appropriate 55 percent from The Colbert Report’s average audience in 2014, Stephen’s last full year on the job," Joe Concha wrote Wednesday for mediaite.com. "For those mathematically challenged trying to score at home, that means Wilmore has lost more than half of the audience he inherited in a scant 12 months. Not sure if that’s some kind of record, but it oughta be. . . ."
To mark Black History Month, Adam Harris, assistant social editor of ProPublica, "rounded up some of the best reporting on America’s troubled history with race and inequality," ProPublica declared on Wednesday, providing Harris' list. "Fats Domino and The Birth of Rock ‘n’ Roll premieres nationally during Black History Month on the legendary performer’s 88th birthday, Friday, February 26 at 10 p.m. (check local schedule)," the PBS "American Masters" series announces. "The one-hour documentary traces how Fats Domino’s brand of New Orleans rhythm and blues morphed into rock and roll, appealing to black and white audiences alike. Actor Clarke Peters narrates. Fats Domino was one of the most popular rockers of the 1950s and early 60s. His achievements and record sales during that time were rivaled only by Elvis Presley. With his boogie-woogie piano playing rooted in blues, rhythm & blues, and jazz, he became one of the inventors, along with Presley, Chuck Berry, Jerry Lee Lewis and Little Richard of a revolutionary genre of music, rock ‘n’ roll. . . ."